Achieving ease, harmony and security in your riding and relationship with your horse. Do you ever feel as though you know what you want your body to do but can't get it to comply? Do you struggle to ride one side of your horse as effectively as the other? Do you dream of riding with your horse in perfect harmony, flowing together as one? Or do you know that feeling, and want more of it? When you experience that perfect moment of ease, balance, connection and execution, it all becomes worth it - the frustration, the repetition, the focus, the failure, the effort. It’s a sublime state of flow, when everything just clicks. That is Gestalt: a state of pure presence, balance and wholeness. It comes naturally to horses… and sometimes feels like an unattainable nirvana for riders. We all experience plateaus or blocks at times, and our tendency is often to respond to these ebbs in our flow by trying harder, focusing on one fine point or another of our discipline. Sooner or later, we’re feeling disjointed, out of touch with our horse and thoroughly frustrated. But there is another way: grounded in principles of functional biomechanics, Gestalt Riding is a complimentary approach to improving the horse-human partnership across all equestrian disciplines. Gestalt Riding develops balance and responsiveness through body (somatic) awareness and conscious integration of all elements of the rider’s physical, mental and emotional experience. The horse participates as an interactive bio-feedback partner, giving real-time acknowledgment of shifts and adjustments that enable in-the-moment fine-tuning or anchoring. Gestalt Riding sessions are a synthesis of body awareness, sound biomechanics, dressage fundamentals and positive coaching designed to bring out the best in you and your horse. This holistic approach can lead to increased confidence, better alignment and security in the saddle, greater consistency, as well as improved – and more joyful - connection with your horse. Contact me to schedule a personal Gestalt Riding™ session now. Helping you build successful equestrians through alignment and balance. You can see the potential in your clients – when they have the desire and discipline, you can take them far. But sometimes they hit a plateau or a block – they’re tense, unbalanced, unfocused or obsessing about one little thing… they’re up in their head too much, their confidence is wavering, and you start to walk that fine line between pushing them through it or pushing them over the edge. How do you get them back in their body and productive in the saddle? I work in partnership with trainers to evaluate and re-establish a rider’s physical, mental and emotional equilibrium, so they can more effectively apply instructional guidance. 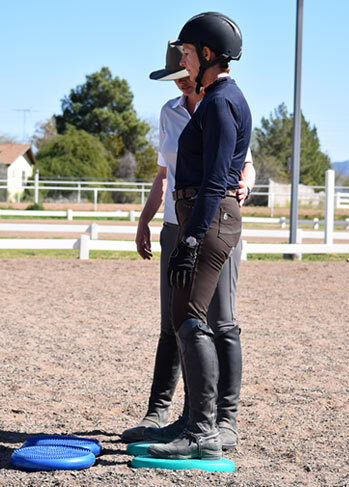 Grounded in functional biomechanics, somatic awareness and dressage fundamentals, Gestalt Riding leverages positive coaching and equine-guided biofeedback to improve a rider’s alignment in the saddle by integrating their physical experience, emotional state, and learning mindset. They learn to identify and listen to the horse’s cues and adjust their biomechanics accordingly, creating a stronger partnership with their horse, that results in better performance from both horse and rider. I look forward to collaborating with trainers of all disciplines to help your clients fully realize their equestrian potential. Schedule a call with me to discuss Gestalt Riding™ and partnering to empower your students’ potential. “Emily has a fine eye for a rider's ease and seat in the saddle backed up by tools to help you shift what is not working for you and your horse. My session with her was phenomenal! I highly recommend her to anyone looking to change their riding experience from the ‘inside out." “I took three lessons with Emily and it completely changed and corrected my seat and my understanding of how a horse communicates. She coached me through specific exercises on the ground and in saddle, which enabled me to become more aware of my existing body mechanics and make the necessary changes to become centered in the saddle. Emily’s kind and gentle demeanor made me feel relaxed, comfortable and self-assured as I went through the process of implementing small, yet significant changes to my body position while on my horse. Not only is Emily knowledgeable about proper technique and body mechanics; she is patient, capable, and simply a wonderful person to work with. I am looking forward to more lessons with this gifted teacher. Thank you Emily!!" Interested in the other programs I offer? Learn about Equine Gestalt Coaching™ and Liberty Practice™ . Questions about logistics? Check out these Frequently Asked Questions or set up a call with me to discuss your needs!